All of you know I use this site to post thoughts on topics mostly related to sport psychology. 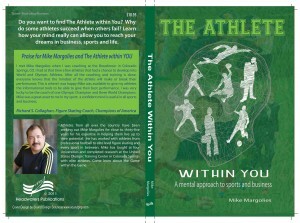 This one is no different, except it is basically an announcement that my book, The Athlete Within You, is in my hands right now. It is the proof copy and we are making a few changes, correcting a few things we missed in editing and getting it ready for market. This is pretty exciting. It has been a long time in process as many of you know. I was given a contract to write a book in 1979. All I had to do was produce a prospectus, a long outline and the deal was done. Couldn’t do it. I’ve written about this here and in other places, so I won’t bore you again. But now it is done (or just about). Yes for those of you that are wondering, it tastes like sushi and fine tequila (if I could afford it, Herradura Seleccion Suprema). If you don’t know why I said this, then find my posts on goal setting and it will make sense or wait till next week and pick up a copy of the book. This won’t be the last time I thank them, but I will mention them here. These people along with some other friends have been a huge support for this project, and I need them to know how much I appreciate them, their time and unconditional support. Thank you all. I will of course post exactly how you can find the book later next week. It will be available via amazon.com of course. Purchase direct from me for an autographed copy. Click on the book cover and you will be whisked away to my store. Looking forward to the long awaited book. Congrats Mike. Way to go.